Someone once posed the question to me, "is Mother Theresa in hell?" as though it was an important question... and as though one should be able to make an argument one way or the other. 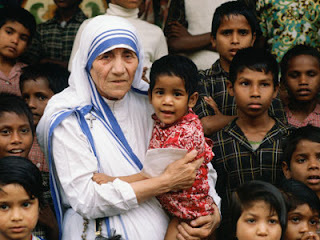 Mother Theresa?! Really? In Case you don't know, Mother Theresa was a Catholic nun who poured her life out on behalf of the "least of these," the poorest of the poor and the weakest of the week. She did pretty much exactly what Jesus called us to do. She did pretty much exactly what the gospel is about even if she didn't always articulate it in systematically theological term. She embodied the love of God and made it real in the lives of the people God loves. So, in light of who she was and what she did, asking the question "is she in Hell?" is nothing short of absurdity. Indeed, it should be offensive to someone who understands the real heart of the gospel. I am bound by the conviction that the gospel of Jesus Christ, God's saving work of incarnation and resurrection, is profoundly relevant. It has everything to do with the world we live in, the lives we lead, the people next to us, the brokenness of the world, the creation God loves. It has to do with real choices, not just of doctrine but more importantly of lifestyle and ethics. When we narrow the relevance of God's saving work down to heaven and hell, to being "saved" or not for some post-mortem otherworldly experience, we undercut the gospel altogether. What God did on the cross was and is for this world. So the real value of doctrine, theology, and religious ideology is found in the way in which it hits the ground. Ideas are only important insofar as they effect and affect our actions in the world--they eventually play-out in the world. Like Jesus said, "a tree is known by its fruit" (Matthew 12:33). Someone's theology shouldn't be judged by some notion of orthodoxy. It should be examined on the basis of it's implementation. What are it's fruit like? But over against actual implementation, we have centralized "salvation" and it has poisoned our perspective so much that we are distracted from any appreciation of the life-giving fruit of someone like Mother Theresa. We are more concerned about whether or not she believed the right things than we are about the people she loved and the way in which she demonstrated Christ's love. The sort of disconnected soteriology, what Rob Bell calls a "disembodied gospel," that places central importance on some other place in the afterlife is essentially and definitively irrelevant. If relevance is about a practical connection to reality, real people in real time, and the gospel is essentially relevant in such terms, then salvation is useless to the gospel. The way in which the disembodied gospel actually hits the ground is by lifting us off of it. It makes us judgmental, saying, "well, are they in hell?" Though so many evangelicals seem to equate the two... salvation is not the gospel. At least not some otherworldly notion of salvation. Jesus' work of incarnation, death, and resurrection--that's the gospel. The gospel is Jesus. Jesus was a real person in real time with real experiences who died a real death and really defeated death through resurrection. Paradoxically, Jesus was really God--God incarnate in reality, not in some otherworldly realm called heaven. The fruit of this gospel includes liberation of slaves, food for the hungry, shelter for the homeless, dignity to the marginalized, hope to the hopeless, healing for the sick, equality, humanity, restoration for the environment, companionship for the lonely, peace, joy, selflessness, sharing, family, kindness, clean water, physical touch, quality relationships, care for words, generosity, service, even life for the dead. Need I continue? We shouldn't be asking "are they in hell?" ...who the hell knows the answer to that question anyway? Instead, we should be asking are we living the gospel of Jesus Christ? What can we learn from the people who are demonstrating and embodying the fruit of this gospel (regardless of their doctrinal articulations)? Are we so grateful for Christ's saving work that we cannot help ourselves from passing it on through the same kind of work? Yes, ideas are important. Theology is important. After all, I'm an aspiring theologian myself. But they're only important insofar as they have a shaping effect on us and on the world. Let's shape the world the way that God would have us shape it. I believe that's why we were put here in the first place.